Our area used to be quite the popular hot spot for Indian tribes centuries ago….our town names of ‘Arapahoe’ and ‘Minnesott’ Beach may have already given away that secret. But every so often, we come across some of the treasures they left behind. 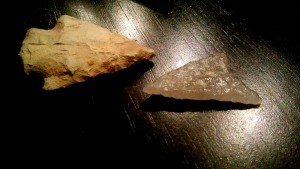 Much to Blair’s dismay (who seems to find everything and considers himself the riverfront hunter and gatherer), I found both of these perfect arrowheads that trump all of his. I found the one on the right on the riverfront beach close to Mill Creek and the one on the left in the driveway of the new Outfitter’s Cottage of all places. I was showing the newly finished cottage to some folks last week and looked down and it was on top of some sand that we had brought in for the driveway. I later found out that the sand was from a dredge pile from Wayfarer’s Cove marina, which made much more sense because we’ve found all of the other Indian artifacts near the river. Our first shadow box of shark’s teeth and arrowheads is full and at this rate, we’ll need another very soon!